GAINESVILLE, Fla.—The 2018 UF Athletic Hall of Fame class was announced Monday by the University of Florida F Club and Gator Boosters, Inc.
During their Gator careers, members of the 2018 Hall of Fame class claimed two national and 14 Southeastern Conference team championships and 14 NCAA individual titles. The induction ceremony for the nine-member class is Friday, Nov. 2 at Exactech Arena at the Stephen C. O’Connell Center. In addition, Caeleb Dressel and Alex McMurtry will be honored as the 2017 Ben Hill Griffin Award Winners – honoring the top male and female student-athlete for the calendar year. Each year, the F Club Committee selects members to the Hall of Fame, divided into three different categories: Gator Greats, Distinguished Letterwinners and Honorary Letterwinners. This year’s class includes eight Gator Greats and one Honorary Letterwinner (Richard Giannini). A Gator Great is a letterwinners who has brought recognition and prominence to the University and themselves by athletic accomplishments as a student-athlete. An Honorary Letterwinner is a coach or athletic official (after retirement) who were not letterwinners or athletes at the University of Florida, yet have rendered outstanding service to the program through personal time, effort, interest. Fans interested in attending the ceremony can contact Kyle Rogers in the Gator Boosters, Inc., office at 352-375-4683, option 3. Nekita Beasley (Women’s Track/Cross Country 1991-92): 1991 and 1992 NCAA Outdoor 800-meter champion, member of 4×400-meter relay team that swept 1992 indoor and outdoor NCAA titles, eight-time All-American, three-time SEC 800m champion, 1991 SEC Outdoor 4×400-meter relay champion, concluded UF career as 800m run school-record holder for indoor (2:04.45) and outdoor (2:02.00). Reggie Nelson (Football 2005-2006): Consensus first-team All-American in 2006, finalist for 2006 Jim Thorpe and Bronko Nagurski Awards, 2006 All-SEC first team, first-round selection in 2007 NFL Draft and 2018 will be 12th NFL season (currently plays with the Raiders). Lito Sheppard (Football 1999-2001): Consensus first-team All-American in 2000 and 2001, first round-selection in 2002 NFL Draft, 10-year NFL career included two Pro Bowl selections (2004, 2006) and was part of 2004 NFL All-Pro team. Josh Walker (Track 2002-2005): 2004 and 2005 NCAA Outdoor 110-meter hurdles champion, six-time All-American, two-time SEC champion, held the 110-meter hurdles school record for 14 years, part of 2004 SEC Indoor Championships-winning team. 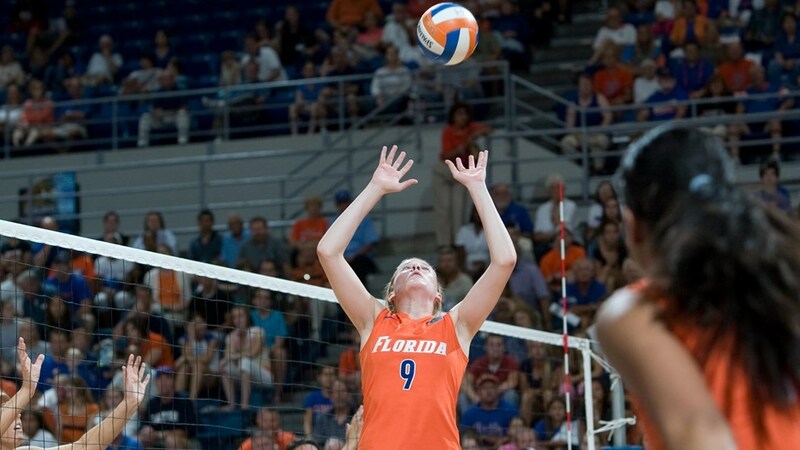 & now, Angie McGinnis will be inducted into the UF Hall of Fame!